Q. How do I remove a student from a course? commas and a space after each entry (Ex: 0123456, 0234567). TCL instructors are not currently able to delete students from courses. To remove a student completely (an action that deletes the student's coursework, grades, and records for that course from Blackboard), please see your division dean. Instructors may, however, choose to change a user's availability in a course. This will make the class unavailable to the student, and they will no longer see it in their list of available courses. 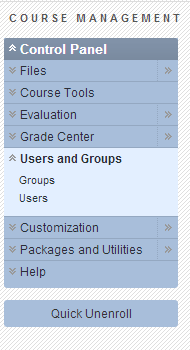 From the "Users" screen, click the edit button by student’s name and choose "Change User's Availability in Course." Next to "Available (this course only), choose "no." Click submit.